Here's a personalized update to the ever popular Hanukkah dreidel top. 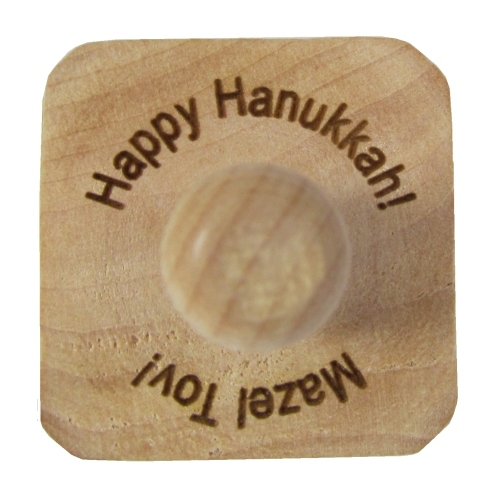 Unlike printed dreidels, each of our dreidels is individually engraved using our state of the art laser engraving systems to cut a high resolution image of each Hebrew letter permanently into the wood. The laser cut is very sharp and high resolution and will never fade or rub off; it gives the dreidel a unique textured look. The dreidels are natural maple hardwood. Sanded smooth but absolutely NO PAINT, NO STAIN, NO VARNISH, NO LACQUER or any other sort of finish is used on these wood dreidels. Totally Green!! We engrave our dreidels to order in one of two formats: "worldwide" and "Israeli". We can also engrave the dreidel with or without the matching English spelling of the Hebrew letter name above the Hebrew letter and we also can engrave a name or message around the top of the dreidel. Please Note: we've tried to use the most common spellings for the Hebrew letters "nun", "gimel", "he", "shin" and "pey" but we know that there are alternative spellings in use. 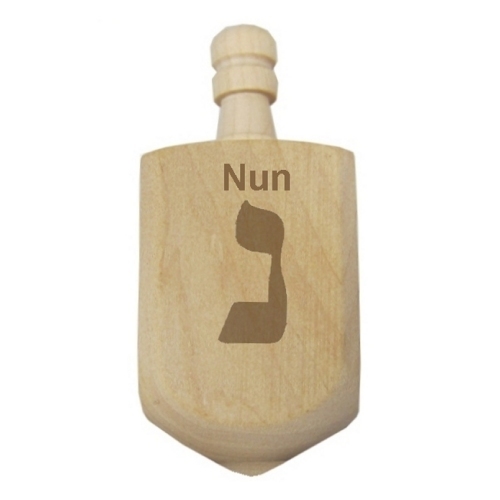 Since we engrave our dreidels to order, if you would like us to use a different spelling on any or all letters just put a note in the "customer notes" section of the shopping cart and we'll use whatever spelling you request. Solid maple hardwood dreidel - all dreidels are made from solid maple hardwood. 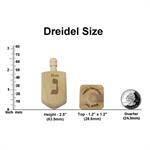 The dreidels are 2-1/2" from tip to top, 1-1/8" wide on each face. Knurled knob on top of the top so you can give it a good spin. Natural wood finish - Our dreidels are sanded smooth and rounded on all sides and edges to eliminate any splinters, jagged edges or rough areas. Completely natural maple wood - no paints, stains, varnishes, lacquers or any other type of finish are used. Totally Green!! 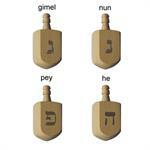 Engraving options - engrave your dreidels in your choice of two standard* formats. 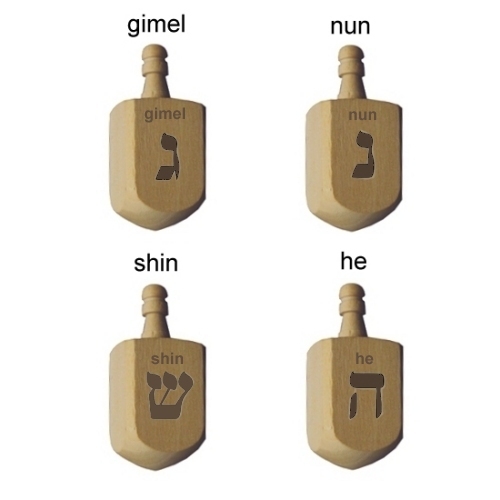 The "worldwide" format engraves the four Hebrew letters "nun", "gimel", "he" and "shin", representing the Hanukkah message, "A great miracle happened there". We can also engrave the letters "nun", "gimel", "he" and "pey" which represent the special "Israeli" version of the Hanukkah message, "A great miracle happened here". Personalize your dreidels - You can have a message of up to 30 characters engraved around the top of the dreidel to personalize it with a name or message just for you. 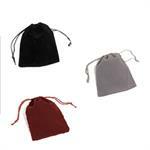 Includes drawstring carry pouch - Your dreidel comes with a drawstring carry pouch in your choice of black, burgundy or gray. Perfect for storing your dreidel dice in your desk, purse or briefcase between games. Don't want a carry pouch? 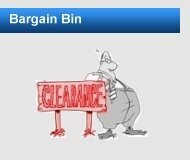 We'll deduct $1 from the cost. 100% American Made - all parts used in the construction of these wood dreidels are made from American hardwood and all engraving is done in Vancouver, Washington USA. 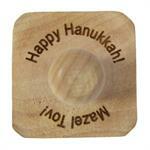 Quantity discounts available - for multiple dreidels with the same engraving. Engraved with your personal message on top these dreidels make perfect Hanukkah gifts for the children of members of your temple or for party favors for Bar or Bat Mitzvahs or give a promotional dreidel as a thoughtful Hanukkah remembrance for your Jewish customers. Delivery to meet your schedule - Standard production for orders of up to 100 dreidels is normally 1 to 7 working days from receipt of your order except for the holiday season from November 15 through December 31 when standard production goes up to 1 to 10 working days to accommodate our surge of holiday orders. PLEASE NOTE: For orders larger than 25 pieces please give us a call. Production times represent production time from our receipt of order to shipment; they DO NOT include shipping time in transit. If you're looking for a hand crafted dreidel for any event made from natural wood and produced in an environmentally friendly way, you need look no further than this design. *PLEASE NOTE: The standard engraving options shown here are but a small fraction of the engraving we can perform with our state of the art laser engraving system. Logos, pictures, names, messages, etc. can all be engraved on many of our products. If you want fully custom engraved dreidels, whether 10 or 100 or 1,000 or more for a special requirement, contact us for details. Please input personalization information so we can engrave your items just the way you want them. Options marked with "*" must be specified. Leave blank or unselected any options that don't apply to how you want your items engraved. After you have input all of your personalization information just select how many of the items you want and add them to your shopping cart.